Clin Cancer Res 2013 19(6), 1422-32. S3I-201 purchased from Selleck. 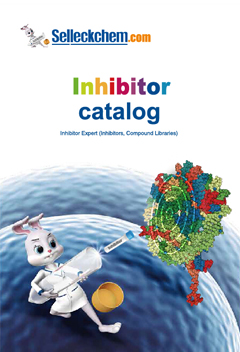 The inhibitors U0126, PP1 and S3I-201 reduce the colony-forming ability of KIF5B-RET positive cells. A549 cells carrying KIF5B-RET were diluted and seeded in 6-well plates, treated with DMSO, U0126 (MEK inhibitor) 10 uM, PP1 (SRC inhibitors) 5 uM or S3I-201(STAT3 inhibitors) 100 uM for 14 days. The total numbers of colonies, each containing more than 40 cells, were determined. (*P < 0.05, **P < 0.01, ***P < 0.001, Student's t test). Mol Cancer 2014 13:176. S3I-201 purchased from Selleck. Inhibition of JAK1/2 with AG490 or STAT3 with S3I-201 leads to reduced STAT3 activation and reduced WASF3 levels. In contrast, treatment with Dasatinib (SRC inhibitor) or Gefitinib (EGFR inhibitor) does not significantly affect activated STAT3 or WASF3 levels. Carcinogenesis 2013 34(9), 1994-9. S3I-201 purchased from Selleck. A. Representative images and quantifications B. of tube formation of human lymphatic endothelial cells (HLECs) cultured with conditioned medium derived from LoVo cells. DMSO was used as vehiche control. Scale bars: 50μm. C. Immunoprecipitation using anti-BRG1 or anti-STAT3 antibodies was performed in LoVo cells, followed by immunoblotting with the indicated antibodies. D. (Left) Western blot analysis of BRG1, STAT3, p-STAT3 expression after transfection with siNC and siBRG1 in the presence or absence of S3I-201 (STAT3-specific inhibitor) in SW480 cells. (Right) Quantitative expression analysis of VEGFC protein levels by ELISA in the supernatants of SW480 cells after transfection with siNC and siBRG1 in the presence or absence of S3I-201 (STAT3-specific inhibitor) in SW480 cells. *p<0.05, **p<0.01. E. The luciferase activity fold change of STAT3 pathway reporter in LoVo and SW480 cells. Oncotarget, 2016, 7(24):36501-36509. S3I-201 purchased from Selleck. GBM6 cells were treated with WP1066 and S3I-201 at the indicated concentrations, and the expression of STAT3, pSTAT3, and p65 proteins was determined by immunoblotting. Ad-CSC, adherent CSC. J Biol Chem 2013 288, 26167-76. S3I-201 purchased from Selleck. (A) The expression and phosphorylation of STAT3 in DCs after inhibition by NSC74859 was measured by western blot. β-Actin was measured as an internal control. The results are representative of three independent experiments. The expression of PD-L1 in DCs after STAT3 inhibition by NSC74859. DCs were seeded at a density of 2 x 106per well in 6-well plates. NSC74859 (100 uM) and TGF-β (10 ng/ml) were added on day 4 of DC culture. Cells were harvested on day 6, and the expression of PD-L1 was analyzed by western blot and flow cytometry. (B) The expression of PD-L1 was measured by western blot. (C) Densitometric analysis from the above immunoblots is shown as a bar chart. Data are shown as the means ± SD from 3 replicate experiments. **P < 0.01 vs. control DCs; ##P < 0.01 vs. stimulated with TGF-β only. Int Immunopharmacol 2014 20(1), 117-23. S3I-201 purchased from Selleck. 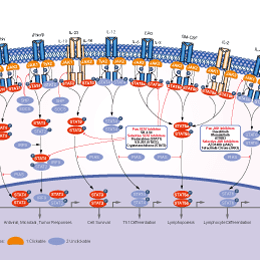 The survival phenotype of A549 cells dependents on transiently activation of STAT3 signaling pathway. A549 cells were mock-invaded (A549, medium alone as control) following treatment with or without NSC 74859 for 24 h. DMSO was used for control. Cell lysates were analyzed by immunoblotting with antibodies to pSTAT3, STAT3 (2 h), and β-actin. Microbes Infect 2014 16(1), 17-27. S3I-201 purchased from Selleck. Effects of LPS on RANKL mRNA expression. aP<0.05. (A) MLO-Y4 cells were incubated with various concentrations of LPS for 4 h. RANKL expression significantly increased after LPS stimulation at 100, 500, and 1000 ng/mL compared to the control, and there were no significant differences among the three groups. (B) The cells were incubated with or without 100 ng/mL LPS for 0.5, 1, 2, 4, and 8 h. RANKL expression increased significantly after 1 h of LPS treatment and reached a peak at 4 h. (C) The cells were pretreated with U0126 (10 μM) and S3I-201 (100 μM) separately or simultaneously for 1 h and then treated with 100 ng/mL of LPS for 4 h. RANKL expression was significantly decreased in presence of U0126 compared to that in the group with only LPS treatment but was still higher than that in the control. However in the presence of S3I-201 with or without U0126, RANKL expression was the lowest, but there was no significant difference compared to the control. Cell Biol Int, 2017, 41(1):84-92. S3I-201 purchased from Selleck. (72 h) with WP1066 or S3I-201 at the indicated concentrations. Method: The MTT assay is based on the conversion of the yellow tetrazolium salt MTT to purple formazan crystals by metabolically active cells. The MTT assay provides a quantitative determination of viable cells. Cells are seeded in 96-well microplates in complete culture medium in the absence or presence of increasing serial dosages of S3I-201 as indicated. At 72 hours after culture, the number of viable cells is measured by adding 100 μL/well of 2 mg/mL MTT solution. After 2 hours, the medium is removed, and the formazan crystals are dissolved by adding 100 μL dimethylsulfoxide per well. The absorbance is read at 590 nm with an enzyme-linked immunosorbent assay reader. Each treatment point is performed in 10 wells or sextuplicate. Animal Models: Human breast cancer MDA-MB-231 cells are injected s.c. into the left flank of athymic nu/nu mice. Formulation: S3I-201 is formulated in DMSO. Siddiquee K, et al. Proc Natl Acad Sci U S A, 2007, 104(18), 7391-7396. Lin L, et al. Oncogene, 2009, 28(7), 961-972. Chen W, et al. Liver Int, 2012, 32(1), 70-77. Sen N, et al. Proc Natl Acad Sci U S A, 2012, 109(2), 600-605.